Texas Hold ’em Poker is my card game of choice and just ask the fellow players in this picture about how deadly my bluff can be! 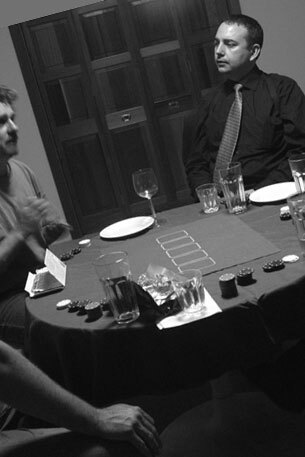 Mind you, you are looking at a table of poker-playing actors so you would expect the bluffing to be top notch! My approach to poker is very instinctive and my strategy is not set for at least five hands. This gives me time to gather data – look at moods, betting habits, facial expressions, and rate of alcohol consumption. After that phase I can then determine who my easy marks are and take a little from them. The key is not to go all out because we need to keep them in the game as human shields when the big guns start blazing. As the weaker players are weeded out, the focus turns to the cards and face reading. Oh, did I mention that I always dress like a gangster and wear my shoulder holster when playing poker? I find it puts me in the right frame of mind and could even unsettle opponents – for a whole host of reasons. To read about how the “other” Steve Davis goes at poker, read this article.